Bloomberg's analysis is based on the financial results and commentary from 23 of the most important US banks to the nation's economy, according to the Federal Reserve. The tax windfall was not unexpected, as banks had been paying higher than average effective tax rates vs. non-financial companies. The financial industry promised to pass the savings along to employees, small businesses and communities in need of financial help. Instead, the 23 firms boosted dividends and stock buybacks 23% and slashed thousands of jobs with a few signaling that more layoffs are in store. 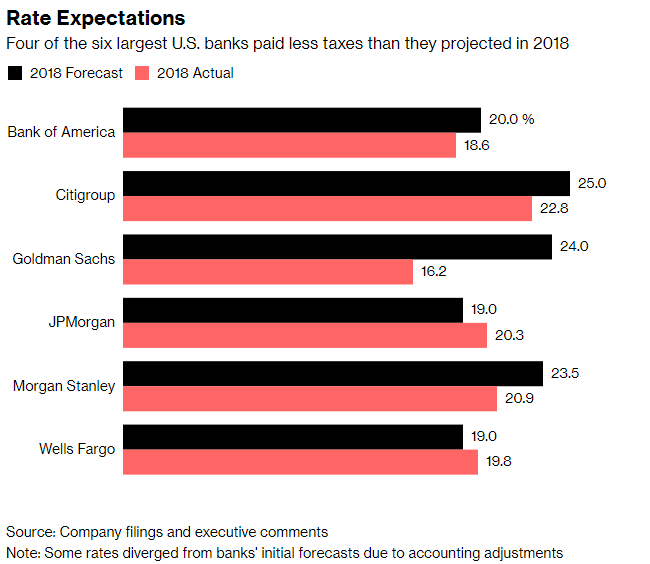 Bloomberg breaks down exactly how bank employees and customers fared following the tax windfall. Employees were a mixed bag. Of bank employees who kept their jobs, some got bonuses - such as 145,000 Bank of America workers who received $1,000 bonuses last year. Wells Fargo rewarded their poorest employees by boosting minimum wage to $15 an hour. 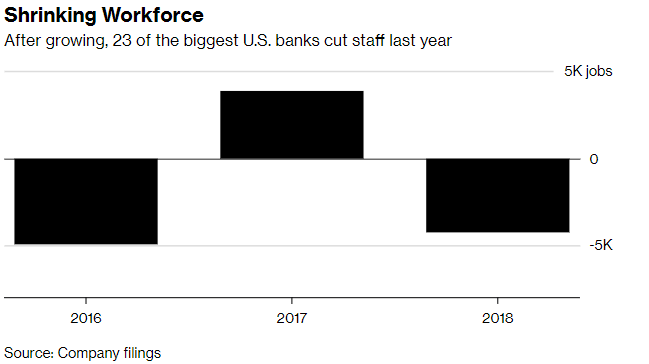 That said, Wells Fargo and Bank of America slashed nearly 4,900 and 4,000 jobs last year - only to be outdone by Citigroup's 5,000 job cuts. While the banks did not provide regional breakdowns, press reports reveal that at least some of the cuts were international. More cuts are on the horizon as well. State Street Corp announced in January that it will be laying off 1,500 people thanks to automation, while Citigroup may cut thousands of staff from their technology and operations areas in the coming years. Those employees who weren't fired received an average raise of 3.6% last year among the 23 banks surveyed. Bank of America, for example, boosted its bonuses last year to encompass more employees. That said, "the ratio of personnel costs to revenue declined as banks gave workers a smaller slice of the money they brought in." Customers, meanwhile, did not benefit significantly from Banks' tax windfall - as loan portfolios only increased by 2.3% in 2018 vs. 3.6% a year earlier. 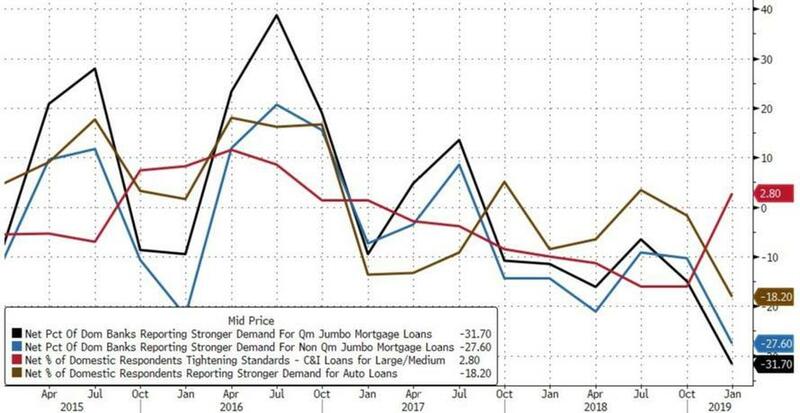 As we reported on Monday, the latest Senior Loan Officer Opinion Survey (SLOOS) by the Federal Reserve, which was conducted for bank lending activity during the fourth quarter of last year, and which reported a double whammy of tightening lending standards and terms for commercial and industrial loans on one hand, and weaker demand for those loans on the other. 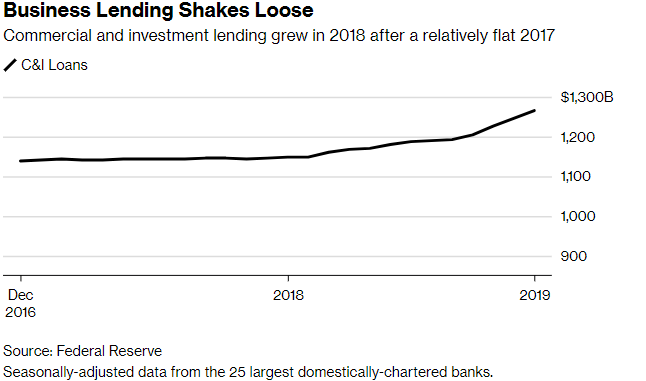 Even more concerning is that banks also reported weaker demand for both commercial and residential real estate loans, echoing the softer housing data in recent months. 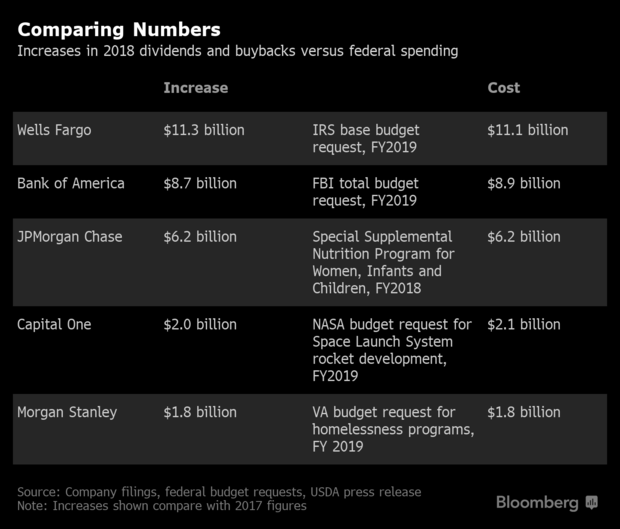 The biggest winners were shareholders, according to Bloomberg's analysis - as the six largest banks surpassed $120 billion in combined profits last year, while dividends and stock buybacks surged by an additional $28 billion over 2017 - an amount greater than their tax savings. According to Dan Alpert - a Westwood Capital managing partner and senior fellow in financial macroeconomics at Cornell Law School, companies "don’t go and distribute cash to their shareholders in the form of buybacks or dividends if they have good investments to make of a long-term capital nature." After Senators Chuck Schumer and Bernie Sanders blasted the corporate stock buybacks in a NYT Op-Ed this week, Goldman CEO Lloyd Blankfein defended how banks used cash, tweeting on Tuesday: "A company used to be encouraged to return money to shareholders when it couldn't reinvest in itself for a good return. The money doesn't vanish, it gets reinvested in higher growth businesses that boost the economy and jobs. Is that bad?"